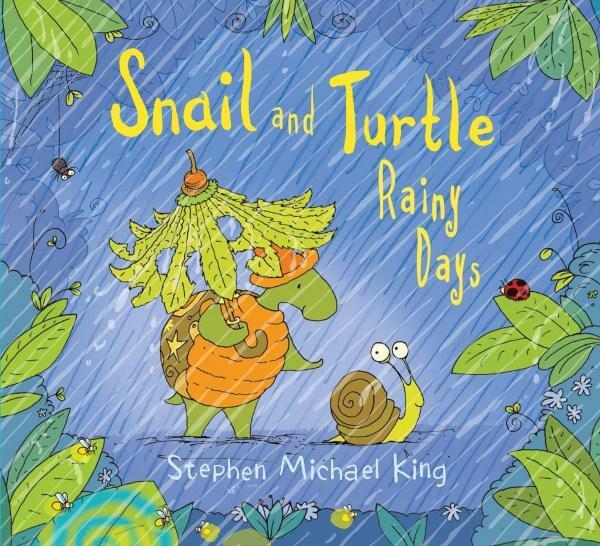 When Turtle woke to play with his friend it was raining and when he knocked on Snail’s shell, he did not come out. Turtle tried to entice Snail out with all the fun tricks Snail usually loved: dancing, juggling, spinning, but still Snail stayed inside his shell. So, as the rain continued, day after day, and Snail continued to stay inside his shell, Turtle waited patiently and built a wonderful surprise for his friend. This is a beautiful picture book story showing the warmth and importance of loyal friendship. Turtle is exactly the sort of friend everyone would love to have, one who stays true until you feel like coming out of your shell. The words used are simple, full of movement, full of repetition and a joy to read aloud. ‘He added shapes and blobs of paint. Everything looked spooshy and bright and runny and wet’ The shapes and blobs of paint are dotted about the pages, twining in and out of the pictures, which moderates the speed and the rhythm the story is read at: ‘He gathered, ripped, bent, chewed ..’ with the author-illustrator providing space for the reader to stop and look at the illustrations. The illustrations are instantly recognisable as belonging to King. The pages have a glow about them, even through the rain, with leaves forming frames around some pictures, and the detail of little animals among the foliage. The wonderful quirky character of Turtle comes out in his expressions, his hat and his beautifully patterned and brightly coloured shell. Snail too, even though he is mostly curled up in his shell, has a sense of character shining through in the lean of his shell, in the way single raindrops seem to find his back, and through Turtle’s interaction with him. A sequel to Snail and Turtle are Friends, Snail and Turtle Rainy Days is a subtle look at depression, and we can all help those who are feeling a little down and out at times. This is a gorgeous picture book for a snuggly read with preschoolers. It will promote discussion about friendships and how we can help each other.